If you have struggled to succeed and/or believe there is some grand purpose to your life that has yet to reveal itself, then you may find Damien Chazelle’s fabulous Whiplash strangely revealing. J.K. Simmons, in the role of his career so far, plays Terence Fletcher, a jazz band director at a prestigious music school in NYC, who represents, in a sense, the darkest parts of our self-conscious. He hurls insults, screams with frustration, and even threatens with physical and emotional pain. He infuses doubt so that those who “have it” are separated from those “who don’t”, or at least from those who “can’t take it”. A little bit of Fletcher is in all of us, putting ourselves down when we lack the courage to do something we want to do, but don’t have the nerve to act on. 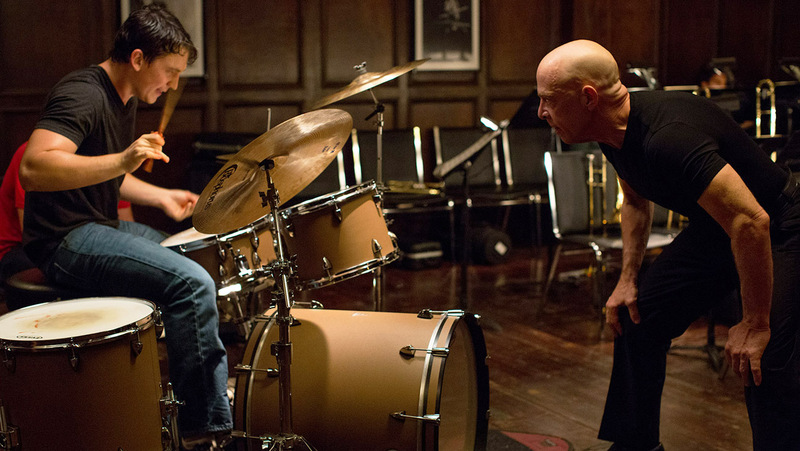 Whiplash opens with a student, Andrew, played by a never-better Miles Teller, practicing the “double time swing” on the drums in one of the school’s dark rooms. Fletcher happens to listen to this talented kid and approaches him, pressing him to continue to play. The next day, Fletcher visits the freshman’s session, hoping to find someone to take onto his advanced music class. Unsurprisingly, Andrew is chosen and with that starts a character study on the pursuit of greatness as seen through the lens of a relationship between a student and his unforgiving and, at times, downright malevolent professor. More than a direct struggle to please Fletcher, Andrew goes through a battle against himself. He must believe in his greatness first, and find a way to showcase it without subjecting himself to the kind of abuse and inhuman sacrifice that Fletcher demands from his students. As much as I wanted to hate Fletcher for pushing his students to the brink of emotional and physical breakdown, there is a philosophy, however skewed, behind his methods that is noble and worthwhile. Fletcher gives it all he has, and for that, he expects the same. His purpose is to find the next great musical talent. How could he aspire to anything else if that is what he believes to be his sole purpose in life? How could he possibly go on living if he robs the world from the next genius? He cannot. At this point we may ask a question to ourselves, much like Andrew did: Is greatness achievable without great personal sacrifice and even pain? Even though the film tiptoes with answering the question completely, it dares to keep the answer somewhat open to debate, appreciating the lesson that guys like Fletcher may give us without embracing his methods, or supporting them. During its frenetic first act, I could not help to see the similarities between Andrew and Aronofski’s Nina Sayers in Black Swan. Both are fascinating character studies of wonderful talents who are victims of the toxicity blanketing the environment they are in. At the same time, they both appear to be their own worst enemies, even if Andrew does not have to contend with schizophrenia like Nina did. In both cases, however, the artistic world is seen as a predatory one, where competition and pressure seem to be even greater than in the often maligned world of finance. 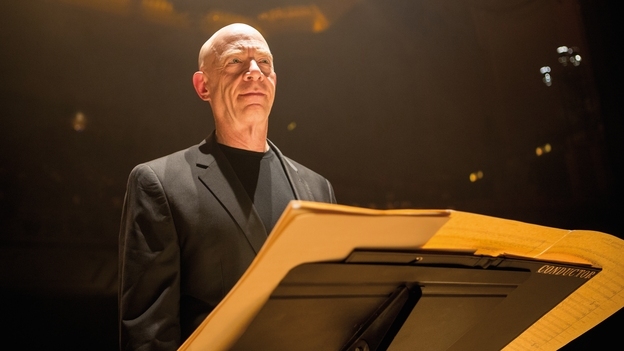 Though Whiplash tends to be too emphatic in establishing a divide between normalcy, represented by Andrew’s father, and greatness; the film can be forgiven because it remains electrifying as long as it stays within the classroom, focused on Fletcher’s antics, and Andrew’s frantic struggle to be the best he can be. It also helps that, throughout this conflict, Whiplash moves to the beat of great jazz pieces. Miles Teller is convincing as the troubled talented drummer in skill, poise and personality; while J.K. Simmons prances about the stage as if he is fed by the vibration of the sound waves. His Terence Fletcher is loud, abusive, and eloquent, which in many instances make him an irresistible character you can’t stop looking at. His performance reminds me a bit of that by R. Lee Ermey, in his fabulous turn as the drill instructor from hell in Stanley Kubrick’s Full Metal Jacket. Both are fit older men, whose physical energy oozes out of their pores, and whose capacity to build the perfect insult is unmatched in speed and conviction. Damien Chazelle’s script navigates through some familiar territory which is not without its faults. Thankfully, Whiplash wraps up with a bang, where all of the accumulated frenzy is released through sheer musical virtuosity that goes uninterrupted for several minutes. It is a scene that speaks to the skill of the film maker, the craft of the actors, and the talent of the musician contributors. Easily, one of the best scenes of the year in one of the best films of 2014. Great review, Niels! I’ve heard J.K. Simmons’ performance compared to his character from Oz, and that just makes me want to watch that show even more. What a phenomenal (and terrifying) performance. I agree with you on the ending, which is easily my favorite from any film of the year. I could not think of a better way to wrap it up.